Nigeria’s Senate President Bukola Saraki has shunned calls for him to account for constituency projects he nominated in the 2017 budget. 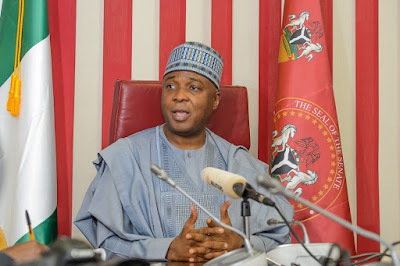 Saraki, the senator representing Kwara Central Senatorial District in the 8th assembly has refused to acknowledge questions raised by transparency agency, Tracka. 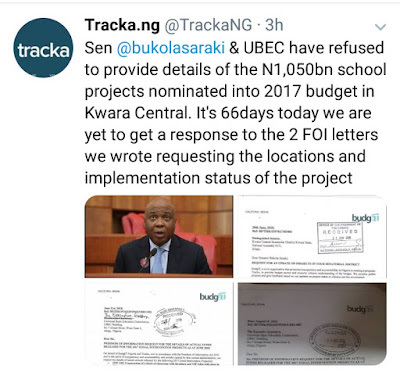 Tracka has repeatedly demanded that Saraki and other federal lawmakers give details of Zonal Intervention Projects that they nominated in the budget. Reacting to Saraki’s silence, Tracka wrote, “Hello Senator Bukola Saraki, It’s over a month, You and UBEC is yet to respond to our FOI letters on the N1,050,000,000 school project nominated in Kwara Central Sen District in 2017 ZIP. We will appreciate you engage them to avail the locations of project and implementation status,” it tweeted with evidence of acknowledgement letters to his office and UBEC. But the tweet on 2 August fell on deaf ears, as Saraki once again refused to respond to the transparency platform’s request. But this time, Nigerians were not going to let it slide.